For travellers who want to go one step beyond the standard UK staycation, there is one outstanding option – an island hopping holiday in the Outer Hebrides. Sitting 40 miles off the west coast of Scotland on Europe’s Atlantic edge, this archipelago of interconnected islands offers a exciting alternative to the usual British break, with each boasting its own unique identity – enticing visitors to make sure they see them all. understand why the spot has been officially classed as the UK’s windiest. 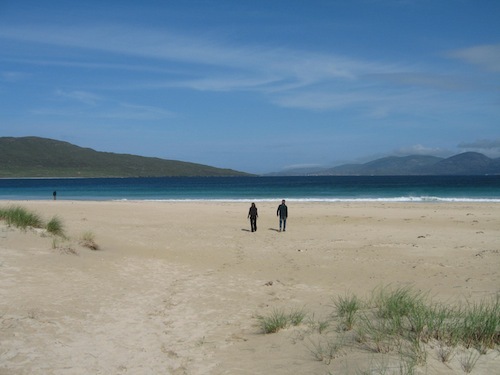 Consider timing your visit to coincide with the Hebridean Celtic Festival (18th-20th July), a live music event that ranks alongside Glastonbury in terms of experiences according to Songlines magazine, then head over to the west coast Lewis and enjoy some of Europe’s most reliable surf, which washes ashore on deserted white sandy beaches, or visit the only legal distillery in the islands at Abhainn Dearg (Red River) for a dram of the local “Water of Life”. Head south across the Harris Hills, where climbing opportunities include Clisham, the highest peak in the Outer Hebrides, and drive down the west coast to see some spectacular Atlantic seascapes – including the beautiful beach of Luskentyre Sands (recently named one of the country’s best in the TripAdvisor Travellers’ Choice Awards), before stopping to shop for a celebs’ current favourite fashion fabric – Harris Tweed – which is woven exclusively by artisans in these islands. On Berneray you can find stretches of sand so beautiful they were once mistaken for Thai beaches by the tropical country’s own tourism bosses, while the Isle of North Uist offers inspirational immersive art experiences along its superb sculpture trail. Follow in the footsteps of Bonnie Prince Charlie as he fled the bloody battle of Culloden and visit Benbecula for a ‘walk on the wild side’. Here you can try your hand at fly-fishing for trout in the 90+ lochs that stud the island landscape, or head to South Uist, home to the “holy grail” of golf in the form of the Old Thom Morris course at Askernish. Film buffs will enjoy Eriskay – off whose shores the S.S. Politician foundered in the forties, spurring islanders to launch a daring salvage mission and providing the plot for the famous Ealing Studios film Whisky Galore; a bottle of the rescued liquor is on display to this day in the islands popular Am Politician bar. Arrive on the island of Barra by plane and you will land on the beach – an experience that ranks among the top in the world for aviation enthusiasts – before heading off to explore the rich Hebridean history and heritage with a visit to Kisimul castle the seat of the Clan MacNeil which stands sentinel atop a rock in the waters of Castlebay. From here south to the final inhabited island of Vatersay to wander amongst the rich machair grasses which are awash with wildflowers in the spring and summer. Every island-hopping holiday in the Outer Hebrides also offers opportunities to add additional adventures to your itinerary – from sea kayak safaris to mountain bike tours and wildlife walks to boat trips to uninhabited outlying islands -including the “Castaway” island of Taransay and dual World Heritage Site at St Kilda, which is home to some of Europe’s largest seabird colonies who make their homes atop the vertiginous cliffs. However visitors want to tailor their island hopping tour of the Outer Hebrides, they will find all the necessary information and inspiration and trip-planning tools on the new dedicated website www.visitouterhebrides.com.uk – which invites travellers to come to the islands and “experience life on the edge” as well as offering detailed information on everything from accommodation to archaeology, heritage to hiking, wildlife to watersports and festivals to flora.